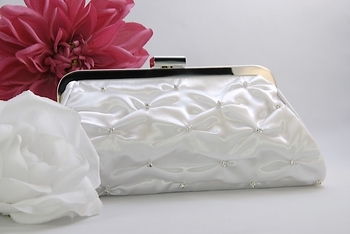 Stunning pick-up style clutch in white satin, delicately adorned with rhinestone accents and smooth clasp. 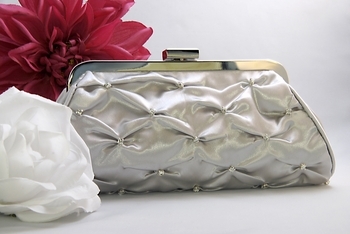 Stunning pick-up style clutch in silver satin, delicately adorned with rhinestone accents and smooth clasp. 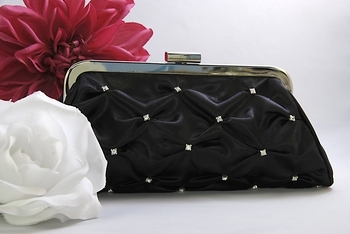 Stunning pick-up style clutch in black satin, delicately adorned with rhinestone accents and smooth clasp. Modern, chic and glamorous! 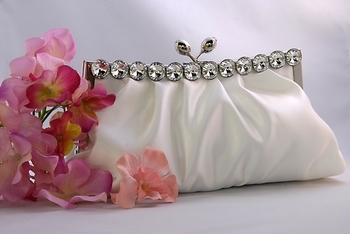 This gorgeous little evening bag features fabulous white matte silk satin and large sparkling clear rhinestones. Also features a framed top secured with a simple silver kiss closure which opens to a single compartment with a slip wall pocket and a hidden silver chain. This is a splendid accessory for your next elegant affair, whether it’s a wedding, the prom or a sophisticated night on the town! Modern, chic and glamorous! 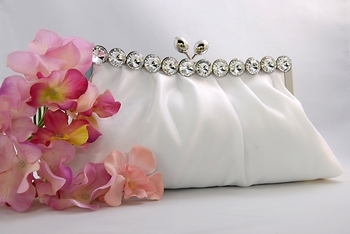 This gorgeous little evening bag features fabulous ivory matte silk satin and large sparkling clear rhinestones. Also features a framed top secured with a simple silver kiss closure which opens to a single compartment with a slip wall pocket and a hidden silver chain. This is a splendid accessory for your next elegant affair, whether it’s a wedding, the prom or a sophisticated night on the town! 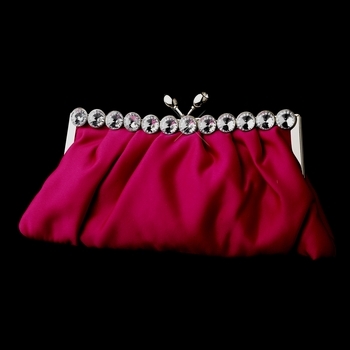 Beautiful and classy this fuchsia satin evening bag is everything you've been looking for. Silver plating embellished with round clear cut sparkling rhinestones truly adds a spectacular shine for your evening! Kiss closure also embellished with rhinestones opens to a side pocket and chain that can be used with or without for an easy over the shoulder bag! 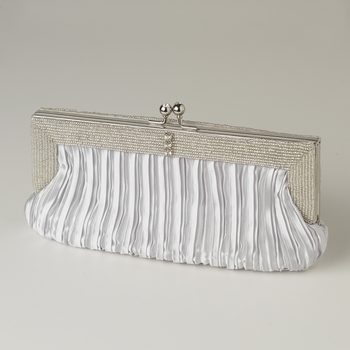 This beautiful silver satin clutch with decorative beading on the outer edge of pleating is absolutely stunning. 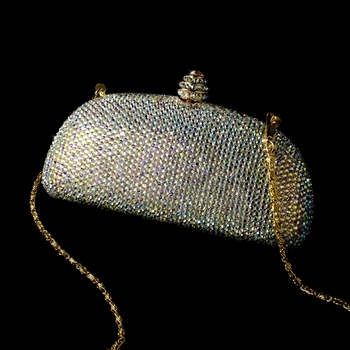 Embellished with three clear sparkling rhinestones on either side of the purse and on the kiss closure this accessory has fabulous features. Inside side pocket and chain that can be used with or without to make into the perfect over the shoulder bag! 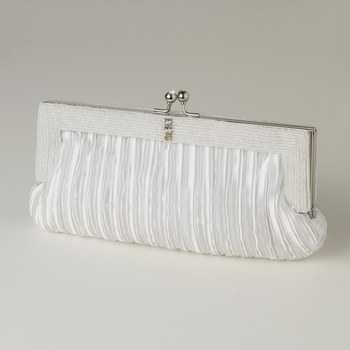 This beautiful white satin clutch with decorative beading on the outer edge of pleating is absolutely stunning. Embellished with three clear sparkling rhinestones on either side of the purse and on the kiss closure this accessory has fabulous features. Inside side pocket and chain that can be used with or without to make into the perfect over the shoulder bag! Elegant Swarovski Crystals Bridal Evening Bag with light gold crystal clasp and black velvet liner. Comes with a gold chain attached inside the purse that can be worn with or without.